Does Eaton Vance Corp (NYSE:EV) represent a good buying opportunity at the moment? Let’s briefly check the hedge fund interest towards the company. Hedge fund firms constantly search out bright intellectuals and highly-experienced employees and spend millions of dollars on research activities, so it is no wonder why they tend to generate millions in profits each year. It is also true that some hedge fund players fail inconceivably on some occasions, but their stock picks have been generating superior risk-adjusted returns on average over the years. Eaton Vance Corp (NYSE:EV) experienced a small rise in hedge fund ownership in Q2, as the smart money sentiment towards the company continues to fluctuate wildly. Hedge funds owned just 3.3% of Eaton Vance’s shares on June 30, which is quite low for a stock of its size. Eaton Vance pays out a dividend that currently yields 3.17%, and has been paying out dividends for the last 38 years, which ranked it 14th on our list of the 25 Best Dividend Stocks for Retirement. How are hedge funds trading Eaton Vance Corp (NYSE:EV)? Heading into the fourth quarter of 2018, a total of 15 of the hedge funds tracked by Insider Monkey held long positions in this stock, a 15% gain from one quarter earlier. 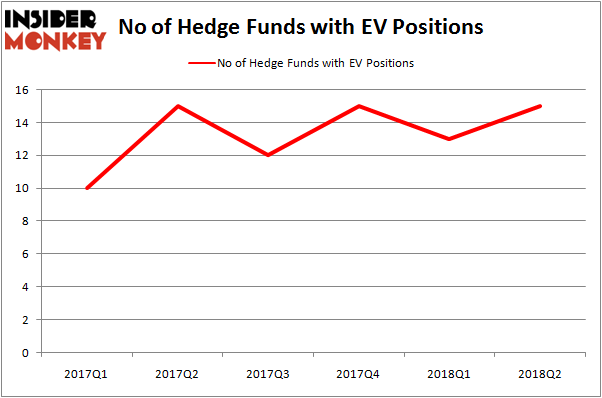 The graph below displays the number of hedge funds with bullish position in EV over the last 6 quarters. So, let’s check out which hedge funds were among the top holders of the stock and which hedge funds were making big moves. According to publicly available hedge fund and institutional investor holdings data compiled by Insider Monkey, Ken Griffin’s Citadel Investment Group has the largest position in Eaton Vance Corp (NYSE:EV), worth close to $77.1 million, corresponding to less than 0.1% of its total 13F portfolio. Sitting at the No. 2 spot is Millennium Management, managed by Israel Englander, which holds a $37.6 million position. 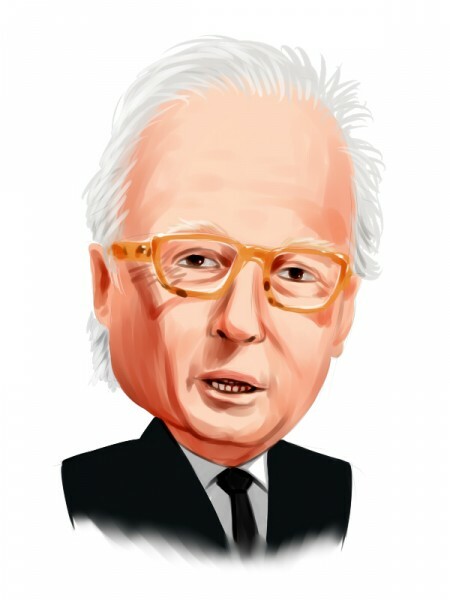 Some other hedge funds and institutional investors with similar optimism encompass James Parsons’ Junto Capital Management, Roger Ibbotson’s Zebra Capital Management and Sander Gerber’s Hudson Bay Capital Management. With general bullishness amongst the heavyweights, key money managers have jumped into Eaton Vance Corp (NYSE:EV) headfirst. Hudson Bay Capital Management, managed by Sander Gerber, initiated the largest position in Eaton Vance Corp (NYSE:EV). Hudson Bay Capital Management had $10.4 million invested in the company at the end of the quarter. Alec Litowitz and Ross Laser’s Magnetar Capital also made a $0.3 million investment in the stock during the quarter. The other funds with new positions in the stock are Michael Platt and William Reeves’ BlueCrest Capital Mgmt., Noam Gottesman’s GLG Partners, and Benjamin A. Smith’s Laurion Capital Management. Let’s go over hedge fund activity in other stocks – not necessarily in the same industry as Eaton Vance Corp (NYSE:EV) but similarly valued. These stocks are Pivotal Software, Inc. (NYSE:PVTL), Phillips 66 Partners LP (NYSE:PSXP), BWX Technologies Inc (NYSE:BWXT), and BOK Financial Corporation (NASDAQ:BOKF). All of these stocks’ market caps match EV’s market cap. As you can see these stocks had an average of 15 hedge funds with bullish positions and the average amount invested in these stocks was $200 million. That figure was $207 million in EV’s case. BWX Technologies Inc (NYSE:BWXT) is the most popular stock in this table. On the other hand Phillips 66 Partners LP (NYSE:PSXP) is the least popular one with only 2 bullish hedge fund positions. Eaton Vance Corp (NYSE:EV) is not the least popular stock in this group but hedge fund interest is still below average. This is a slightly negative signal and we’d rather spend our time researching stocks that hedge funds are piling on.